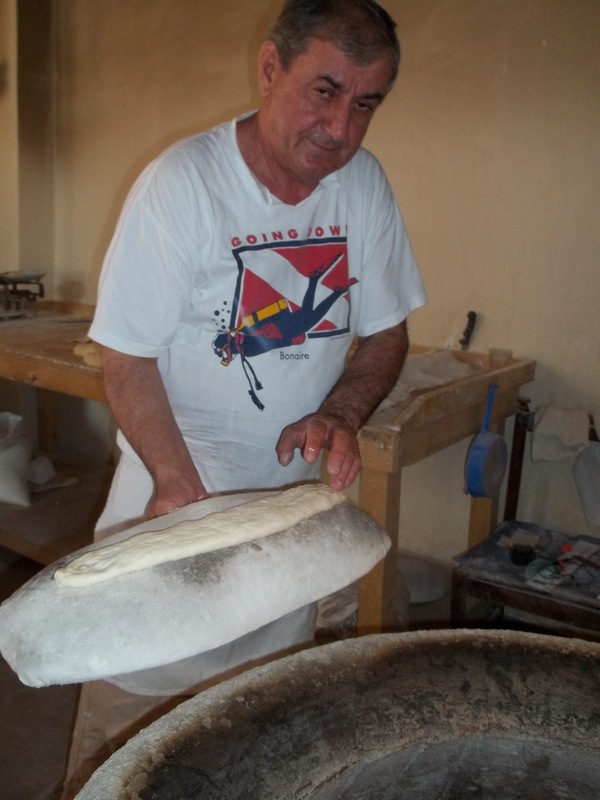 We recently returned to our bakery, Trepezi, in our neighborhood in Tbilisi to see how our baker, Zaur Skhirtladze, makes Lobiani (boiled bean bread). 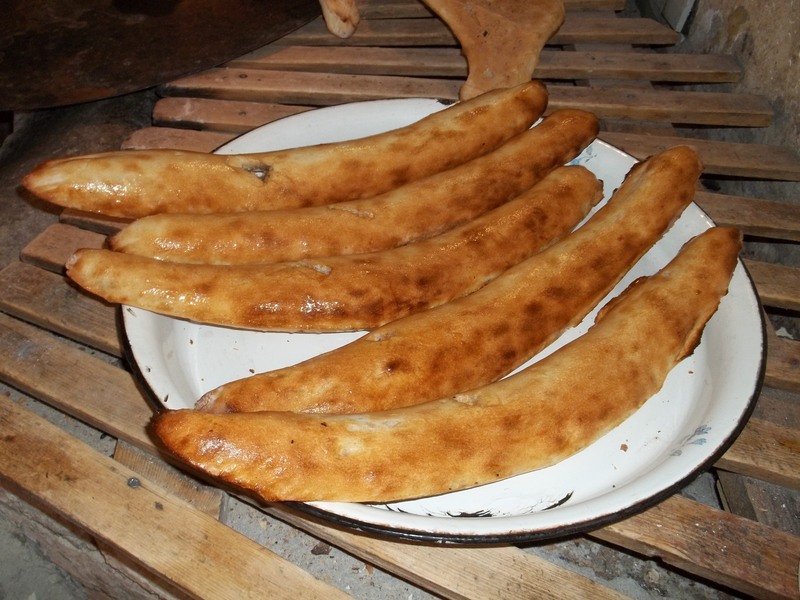 Lobiani is enjoyed all year round and especially eaten on the Georgian holiday of Barbaroba, or St. Barbara’s Day (December 17). 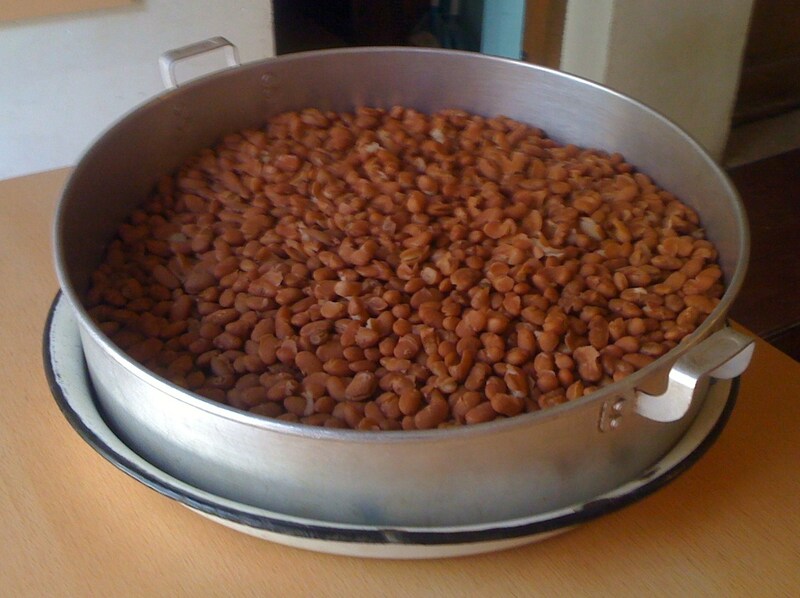 The main ingredient of Lobiani is boiled kidney beans. Zaur told us that after boiling, the beans are mashed and mixed with butter, salt and pepper. 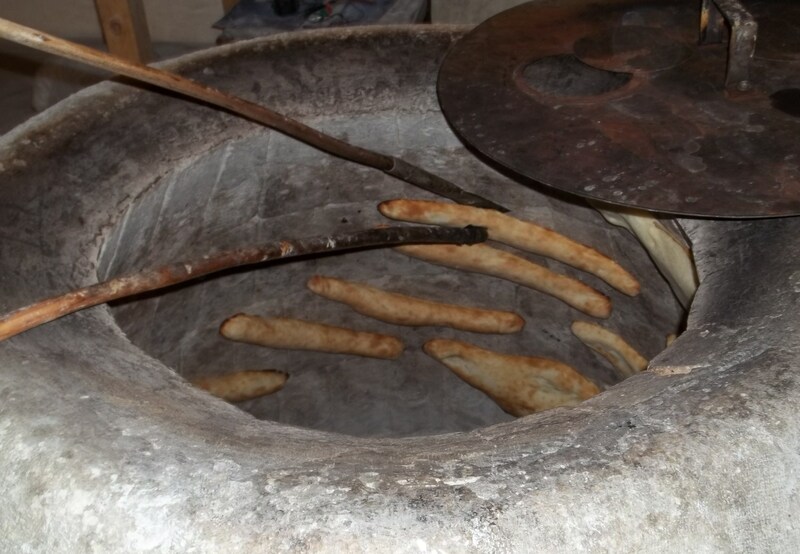 The dough used to wrap the bean filling is the same as the dough used to make Shotis Puri (traditional Georgian bread). 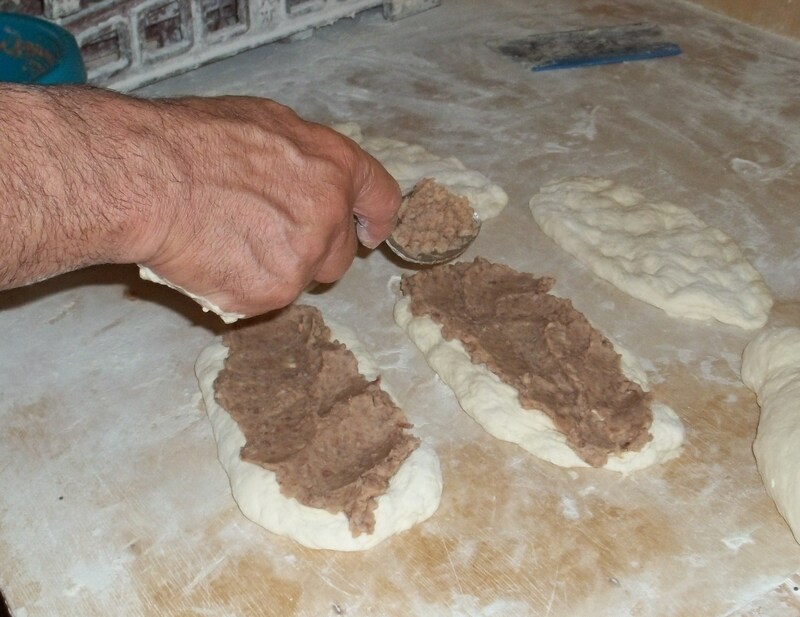 Each Lobiani begins as a flattened piece of dough, which is kneaded by hand. 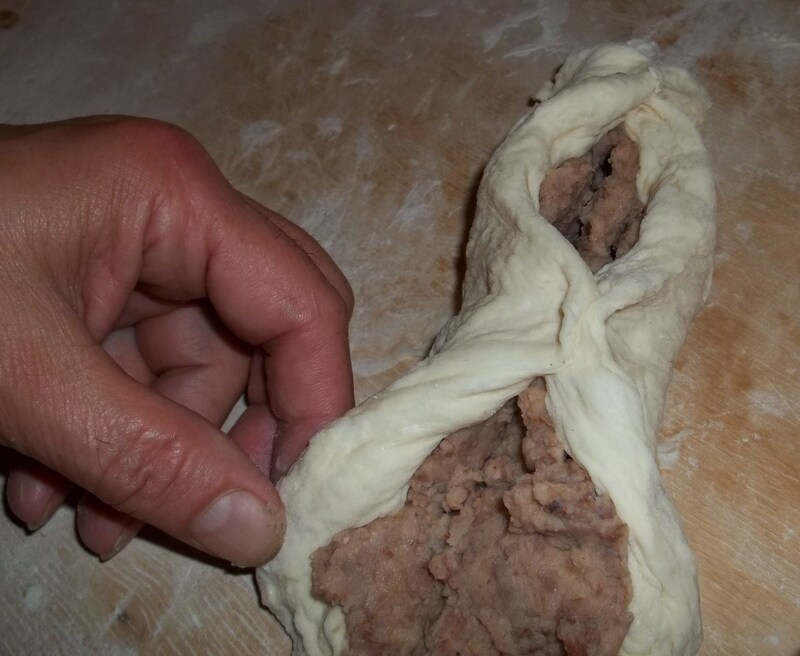 The bean filling is spooned onto the dough and spread evenly. 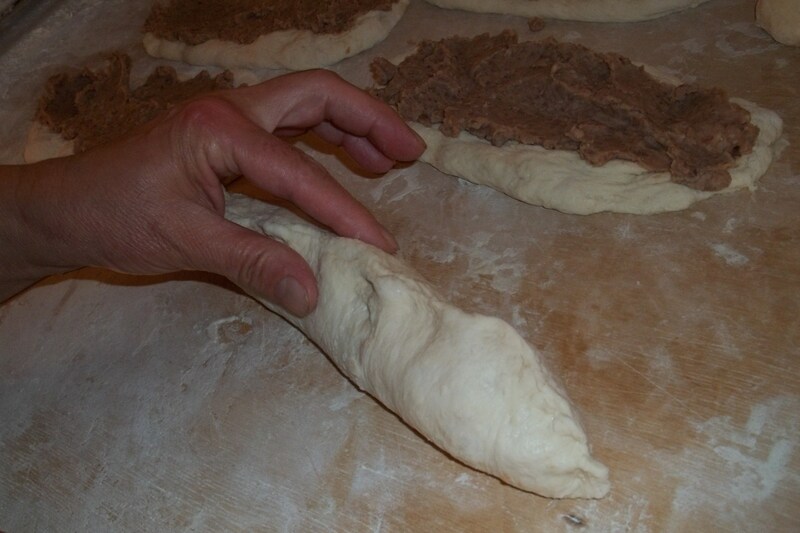 The dough is then wrapped around the bean filling. The sides are pinched together. 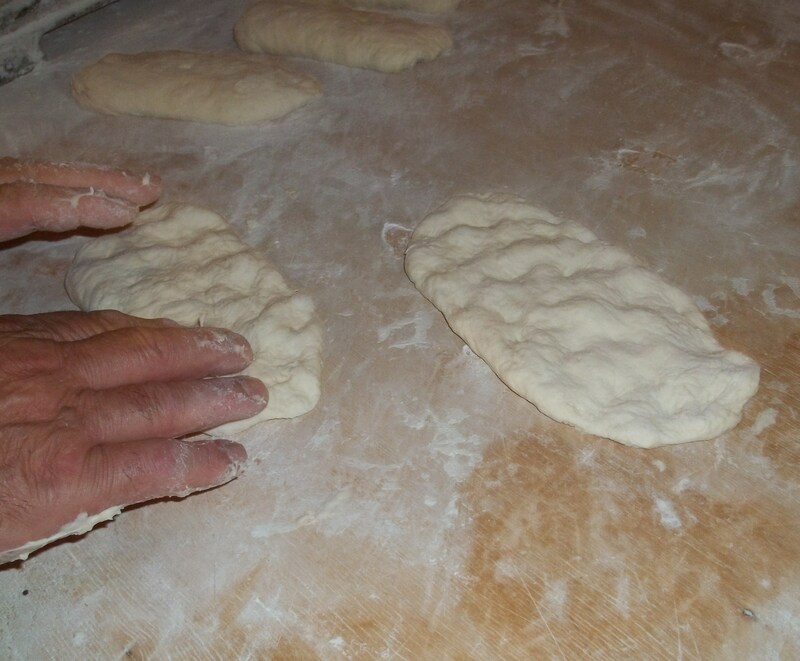 Each Lobiani is stretched onto a special linen covered pad (called Lapati in Georgian) and gently flattened. The Lapati is used to place the dough inside a deep circular oven called a tone. The Lapati has a thumb hole that is used by the baker when he places the dough in the tone and presses it firmly against the inner wall. 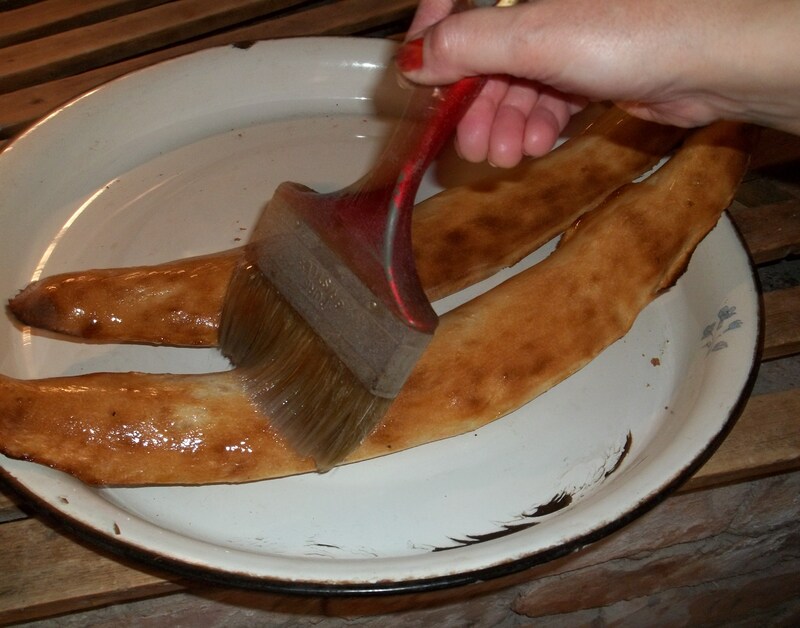 As the Lobiani bakes it turns a golden brown and is ready to be removed in 7-8 minutes. 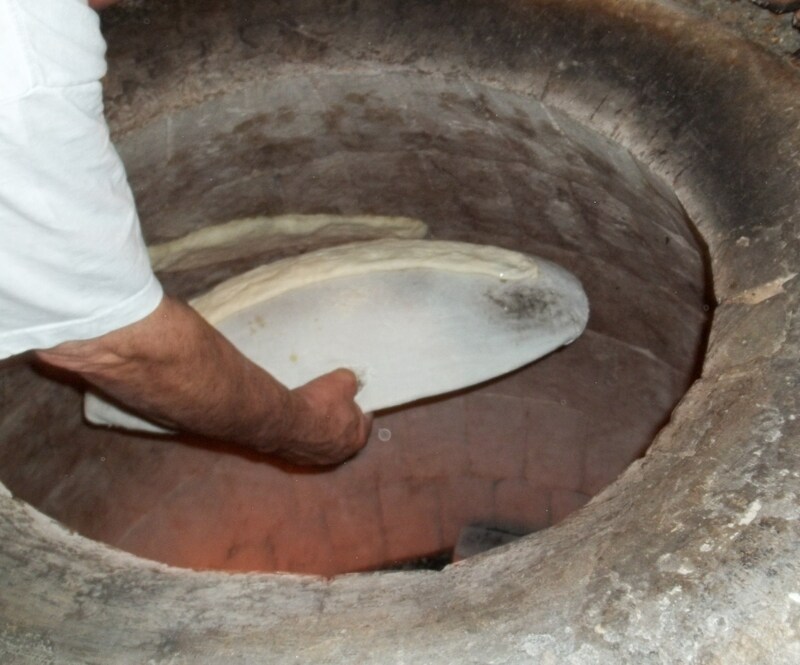 The baker uses two specialized tools to remove the baked Lobiani. One is called Kavi and is used to stab the Lobiani and the other is called Safkheki and is used to dislodge the Lobiani from the wall of the tone. 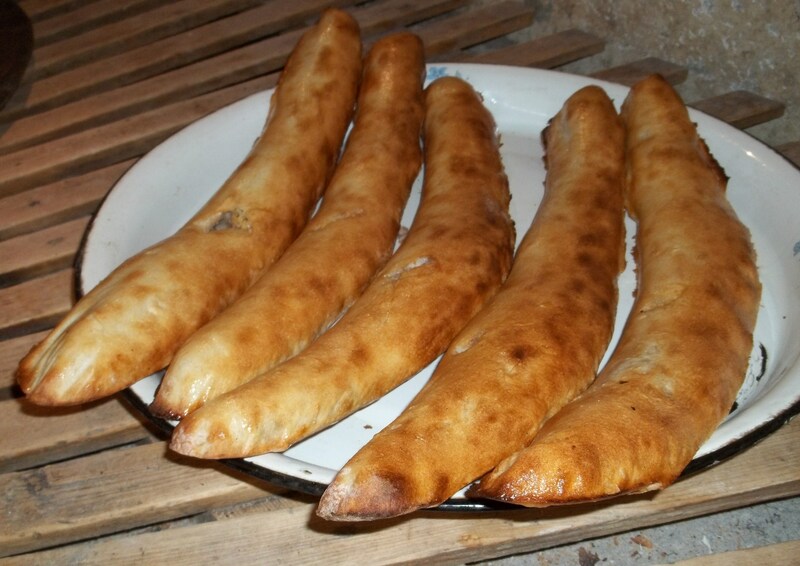 The freshly baked Lobiani are brushed with butter or oil for a beautiful glazed effect. 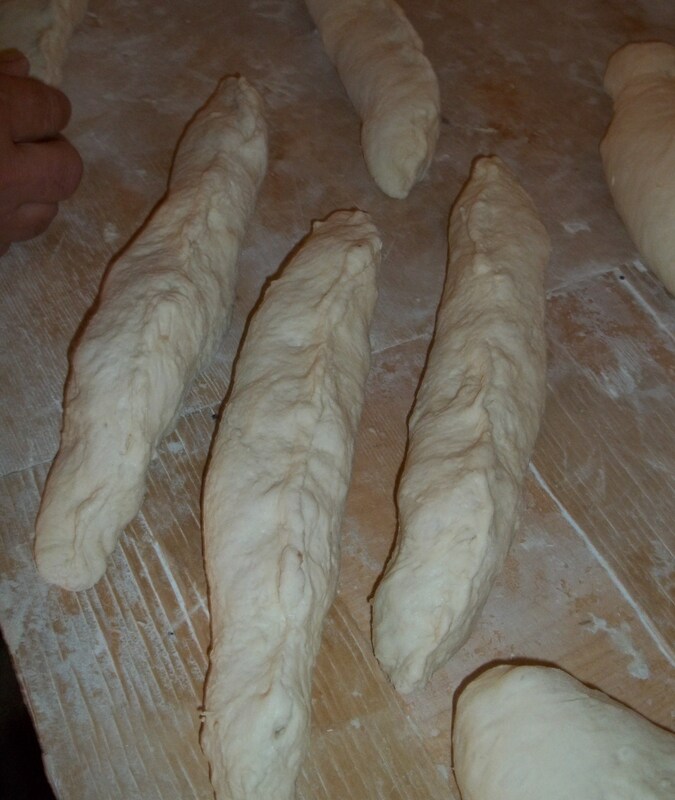 In a future post we will show how Lobiani can be made at home (step-by-step process). 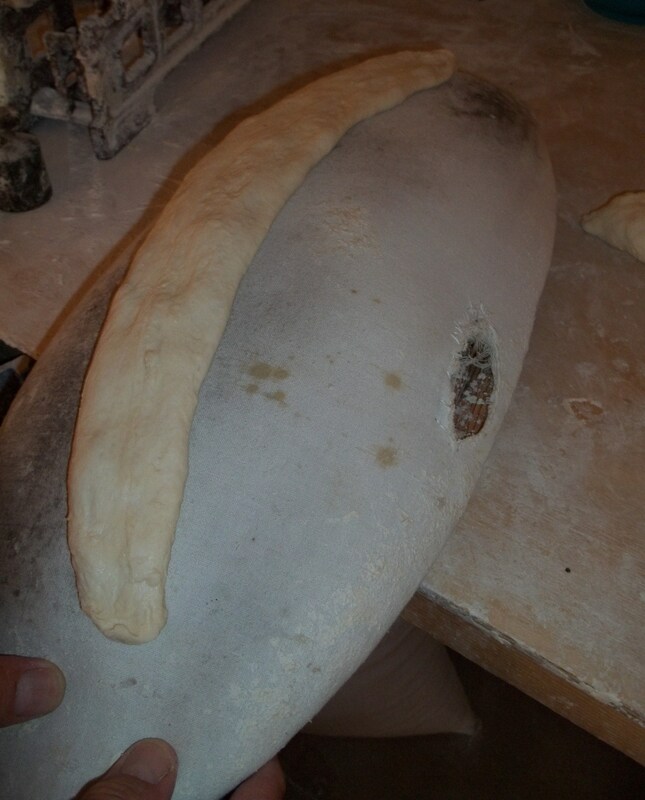 We would like to thank Zaur Skhirtladze and the Trepezi bakery for showing us how real Georgian Lobiani is made. 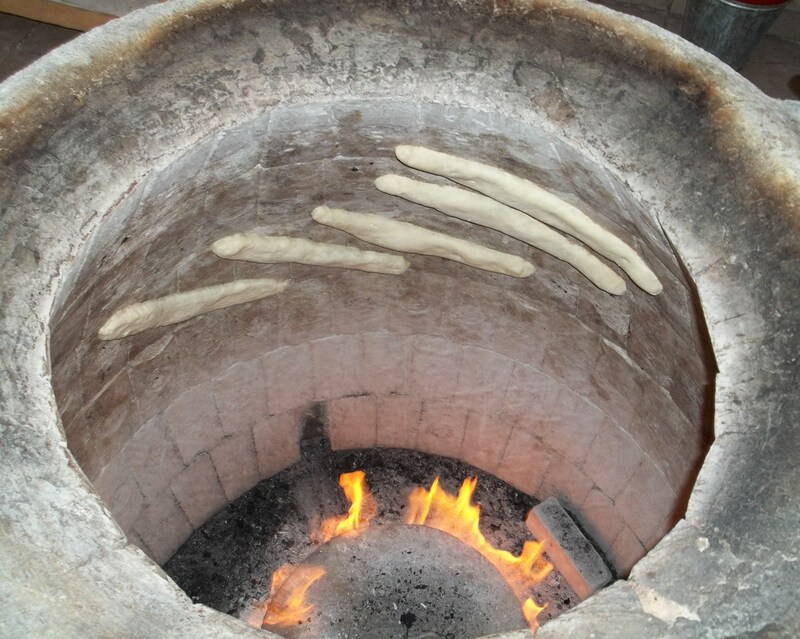 More information about traditional Georgian bread making can be found here. Yum, yum, yum! I can’t wait to learn how to make this!! That looks so good — also nutritious, especially with all the protein from the beans. Looking forward to the how-to for home. Nutritious and filling Lisa – I make lobiani at home and the next time I do I’ll take photos and write a step by steo guide. Yummieeeee! yes, please! for the step-by-step-guide for home-made lobiani! I’ll be interested to see how you make the bread at home with a regular oven. I’m sure that if I had to cook in a tone, all of my bread would end up in the fire. Ooohhhh! That sounds so good! Interesting! You could if you wanted have fun experimenting with other fillings too! Thank you for this interesting article! 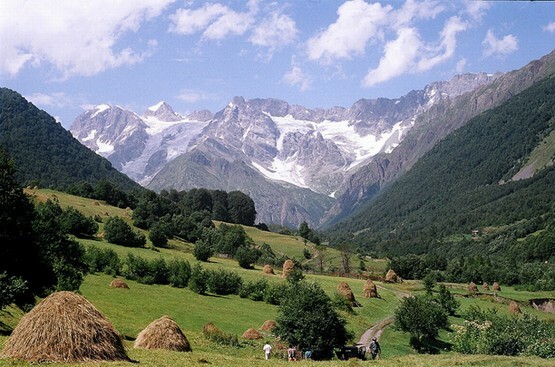 We would like to feature some Georgian specialties on our Austrian food blog http://www.vom-essen-besessen.at, and would like to use one or two of your images (lobiani and shotis puri). Thank you for your interest. I am happy for you to use images and link back to the Georgia About blog.